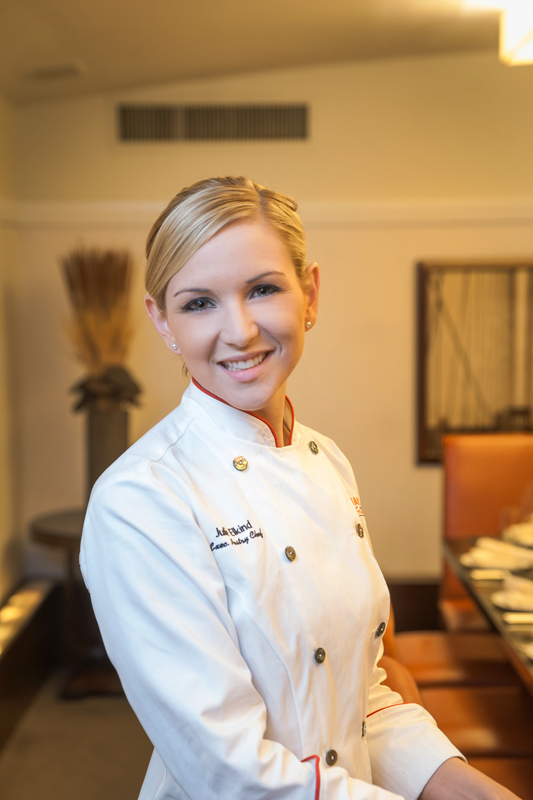 #SCBDExclusive Interview with Executive Pastry Chef & Playing with Fire star Julie Elkind! Two weeks ago, E! premiered a new show, Playing with Fire which is based on the lives of some of the heavy hitter’s in New York’s culinary scene such as Candice Kumai, Anna Boiardi, The Koch twins, and Julie Elkind. With her drive and motivation at the age of 26, in four years Julie became the Executive Pastry chef for the ESquared hospitality group and just recently took on the position as the Executive Pastry Chef at Executive Chef/Partner Michael Ferraro’s Delicatessen in SoHo (see her intro in the show in the clip above). I spoke with Julie and we discussed life, her path to success, favorite dessert to make, new position at Delicatessen, and of course, Playing with Fire. SCBD: You’ve been doing pastry for a while now, who influenced you to get into it? JE: It’s been in my family ever since I can remember. I grew up around some really great home cooks, we’d always be working on different projects in the kitchen. It’s amazing to do pastry for a living. I never really feel like I’m working because it’s a labor of love. SCBD: In the show, Playing with Fire we see that you are always out to prove yourself, did this start when you were back in school? JE: I was always great at Science & English in school. Math was never my strong point until I was able to bring it into pastry and use it everyday. I always felt like I had to prove to my parents that I could do well since they set such a high bar for me. The most important for me to prove something to is also myself. I am always challenging myself with new concept and ideas that the mainstream may not accept right away. I’m still always learning everyday and feel even as a veteran being in the industry thus far I still have to prove myself in the kitchen. I also think its important that people in the industry listen to the next generation of chefs and our ideas. SCBD: Where did you go to school for pastry? JE: I attended the Culinary Academy of New York which is now the Star Career Academy of New York. During my time there I learned a lot of basics and everything to prepare for my hands-on experience in the kitchen. SCBD: When you started did you ever imagine you’d come this far? JE: I believe when you start doing anything you love you want to come far and I always wanted to be a successful pastry chef. I never imagined the show would come about but I’m always making sure I am staying humble. In my opinion, staying humble is the key to the growing and creating process. SCBD: What advice would you give to aspiring pastry chefs? JE: Never rush yourself. A lot of my generation feel that they have this sense of entitlement that they will be a famous chef once they are out of school. It may look easy but it’s not, it requires time and must be a labor of love. They should be patient and keep creating their own ideas. Also, I believe its important to never rush into a job that your not ready for. If you don’t think its meant for you, wait your turn and take a job when the time is right. That was some of the best advice someone gave me. Never be afraid to ask questions and never assume. Always use your commonsense especially in the kitchen. You gain your place and respect in the kitchen by hard work. SCBD: At the young age of 26, you’ve gained so much success and recognition as a pastry chef and now with Playing with Fire. What advice do you have for millennials on the path to success? JE: I am always giving my staff tough love as a manager but I always give them encouragement when they do something worth rewarding. I just want them to be able to teach other chefs what I taught them. Staying humble is key and you must believe in your own food or brand. Being a pastry chef is what I always wanted to do. I personally find success when customers are enjoying the food I create. I want my food to bring a sensory and memory connection to them that may not necessarily be a food trend. Any dish I make is something I am personally proud of and would not sell it if I wasn’t. SCBD: On that note, congratulations on your new position as Executive Pastry Chef for Delicatessen in SoHo. What do you like most about the new position? JE: Executive Chef/Partner Michael Ferraro (Delicatessen) has the same style as me just on the savory end so it’s the perfect collaboration. It’s good to work with another chef that’s an equal because we work as a unit. When I took the job my instincts told me it was right and it’s been great to be respected by a fellow chef. It’s a great positive atmosphere because where I can grow. SCBD: What is your favorite dessert to make at home? On the job? JE: I love making ice cream and gelato because you can make tons of flavor combinations. I love coming up with new ideas, it’s the best part! I get butterflies when I change a menu because I am so proud and excited of my food. I am always checking to see what is in season by going to the local green market. I am alwayss painting a picture of a new dessert just by spotting a fruit or citrus I can use there. I love taking different flavor profiles on successful dishes rather than just using what worked before. SCBD: Playing with Fire is really taking off, what should see expect to see from you this season? How does it feel to be part of this successful show? JE: This season on Playing with Fire you will see what I did at the previous company I worked for to get where I am now. You will also see my constant balance between relationships, time in the kitchen, as well as my social life. You will see how it’s possible to have it all with the right people by your side. I believe you always have to keep pushing through even if you hit a speed bump. You will see how I handle bumps in the road but with strength and endurance I keep moving forward. You will get to know me personally and see some of my stressful moments at home and at work. New York City is a demanding city to live and work in. I don’t want to give too much away but you’ll have to tune in to find out more. SCBD: Last, where do you see yourself in five years and what are some quotes you live by? JE: If you asked me five years ago, I’d never imagine I’d be where I am now. I am constantly challenging myself and making sure I serve the best quality desserts. I’d love to work towards getting a James Beard award and being recognized by the James Beard Foundation for my work. I really aspire to be like the previous James Beard award winners who give back and leave a legacy, it’s a lifetime of work. Since not everyday is the same, I just want to do great work and get recognized for it. “Commonsense isn’t always common”, which I am always saying in the kitchen. You can catch Julie on Playing with Fire on E! at 8PM EST on Friday nights. You can tweet her @JulieElkind & become a fan of her on Facebook, here. Don’t forget to follow Delicatessen @DeliNYC too! This entry was posted in Interview, Sara Monica, SCBD, SCBDExclusive, Small Chick Big Deals and tagged blt restaurant group, delicatessen, e!, interview, julie elkind, new york, pastry chef, playing with fire, sara monica, scbd, small chick big deals, tv show by smallchickbigdeals. Bookmark the permalink.